Standard image files, such as .jpg, .gif, .png, and even .pdf can be used directly in web pages. 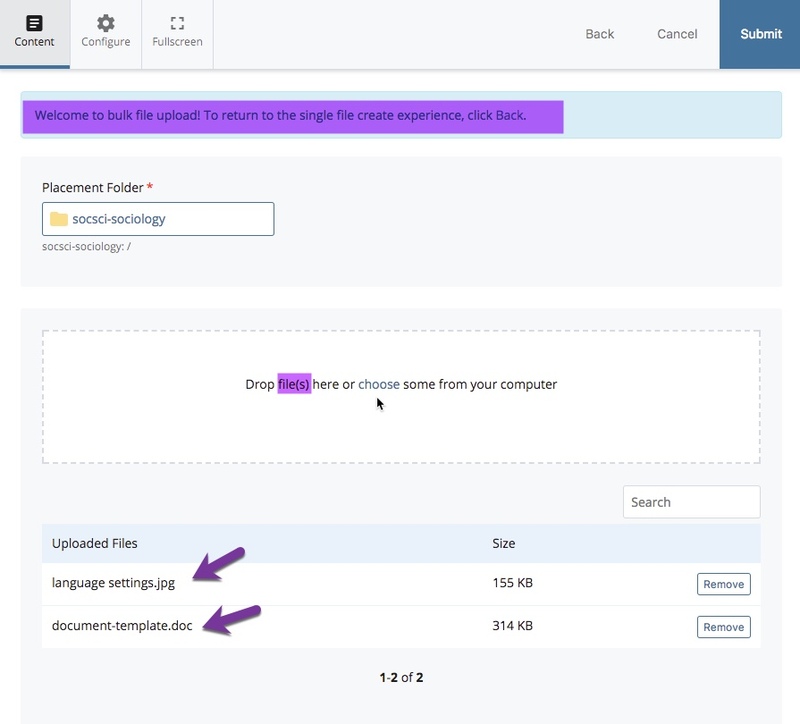 Other file types can be uploaded and posted, for users to download to their computer. *All files need to be optimized (made smaller) prior to uploading to the WCMS! Large images and PDFs on pages makes page loading take longer and if someone is on a mobile device, adds considerable data usage. Note: There is a 10 MB file size limit for uploading files. See About Images for tools to reduce image file sizes. See Preparing PDFs for reducing PDF file sizes. For instructions on using images in your web pages, see Working with Images. Select the folder in which you want to place the file. Images should go into an "images" folder, to keep your site structure clean and easily managed. Select "Add Content" from the menu bar, and then click "File". You MUST include the file extension in your system name (e.g. : my-image.jpg). If you forget the file extension, you will see gibberish code instead of your file. Click "Drop a file here or choose from your computer" in the Upload area and browse to locate the image or file on your network or local drive (or drag and drop file(s) one at a time into the specified area). Click "Preview Draft" then click "Submit". 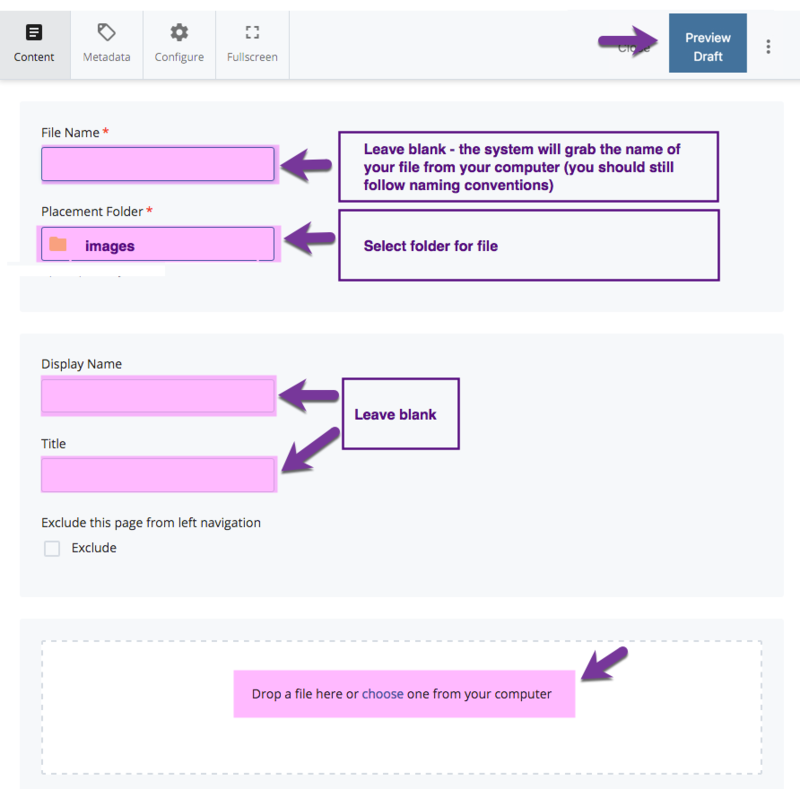 *You can also upload a file from your desktop to the WCMS from the link chooser in the WYSIWYG editor. The file name still needs to have an extension.